The member has proper basic swim level to join in the training. Registration fee for the club is $20,- ( incl. a swim cap). The Membership fee per year is $330,- for the 1st member of the same family and $275,- for each additional family member. Membership may be paid in monthly installments of $30,= for the first member and $25,= for each additional family member. 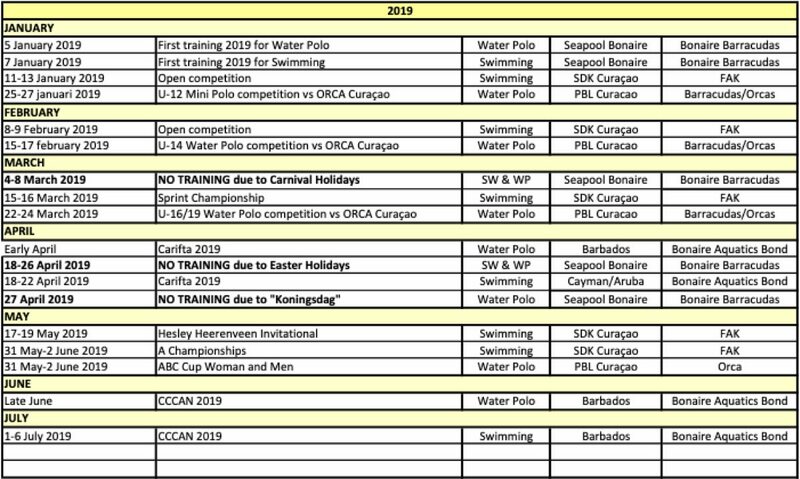 Membership fee has to be paid in advance into our bank account: MCB Bonaire #11153607 by name of Bonaire Aquatics Club “Barracudas”, Kaya Viol z/n, Bonaire. Please make sure to mention the member’s name with each payment! The registration fee and monthly dues are nonrefundable. Members need to comply with the rules and regulations of the club regarding behavior and safety. The club has the right to suspend a member or to deny membership in case of violating the clubs rules.